Since 1976, the John Janzen Nature Centre's interactive exhibits, educational programming and special events have encouraged visitors towards a greater awareness of and engagement with the wonders of nature that surround us. 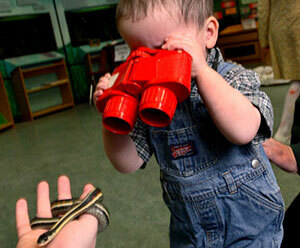 Learn more about the History of the Nature Centre and the Edmonton Nature Centre's Foundation. The current renovations of the Nature Centre facilities have been designed to create even more ways for visitors to experience for themselves the joy of discovering nature in an urban environment. The John Janzen Nature Centre invites visitors of all ages to have fun while learning more about the importance of Edmonton's natural spaces. 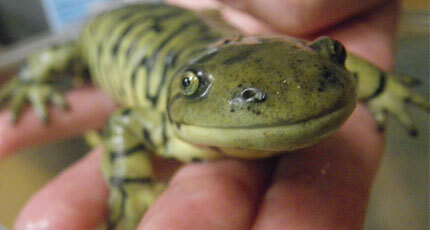 Do you have a nature question for our naturalists? Contact the Nature Line with your questions! View our Facebook page for updated information about upcoming events, featured courses and interesting nature facts and photos. We offer registered programs year-round for schools and groups, child and family courses, birthdays and daycamps. See Programs, Courses & Camps for more information. This new indoor play space re-creates local wildlife habitat in a way that children can learn about nature from the perspective of an animal. Crawling and climbing structures are designed for children up to age 10, although all ages are welcome to explore the rest of the Tegler Discovery Zone. Learn about the seasonal changes of plants and animals. 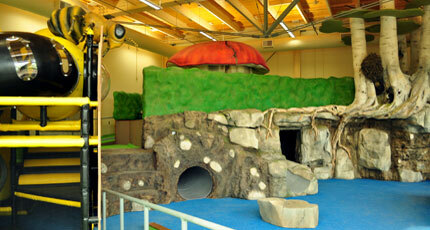 Try on a pair of wings, see the world from an insect’s point of view, or crawl through our ground squirrel tunnel. Check out nature artifacts, try out a nature scavenger hunt, and see our small wildlife (salamanders, garter snakes and frogs) on display. Check out our schedule for available drop-in programs in the Exhibit Room. 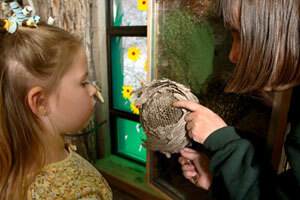 Watch bees, busy at work at our indoor/outdoor working beehive exhibit in the Tegler Discovery Zone. Examine pond life up close and personal at our pond. This water oasis also attracts ducks, blackbirds and frogs in the spring and summer. This outdoor exhibit demonstrates how you can incorporate composting into your waste disposal routine. Learn the composting process and sample composting units designed for large and small yards. Compost 'S cool offers information, courses and programs. There is also a working compost toilet on-site for public use. The John Janzen Nature Centre, Canada’s oldest municipally-operated nature centre, officially opened its doors on October 6, 1976. It was the project of the late John Janzen, Superintendent of Edmonton’s Parks and Recreation Department from 1966-1972, who played a key role in the protection of river valley lands as parks. When it opened, the John Janzen Nature Centre offered courses and workshops, Sunday walks, junior naturalist activities and an exhibit room featuring touch tables and living displays, with programs run mainly by volunteers. By 1988, the centre occupied a unique educational niche, focusing its programming specifically on nature appreciation in Edmonton and the surrounding area. The Edmonton Nature Centres Foundation (ENCF) was formed in 1979 as a non-profit organization to support the John Janzen Nature Centre. The ENCF is responsible for developing a vision for the nature centre, then planning and implementing projects to carry out that vision. Some examples of the ENCF’s projects have been the redevelopment of the pond, maintenance of the compost display, maintenance of the nature trails, development of a native plant garden, and the current expansion of the nature centre facilities. Visitors interested in donating to the ENCF can do so at the John Janzen Nature Centre or by contacting the ENCF directly.